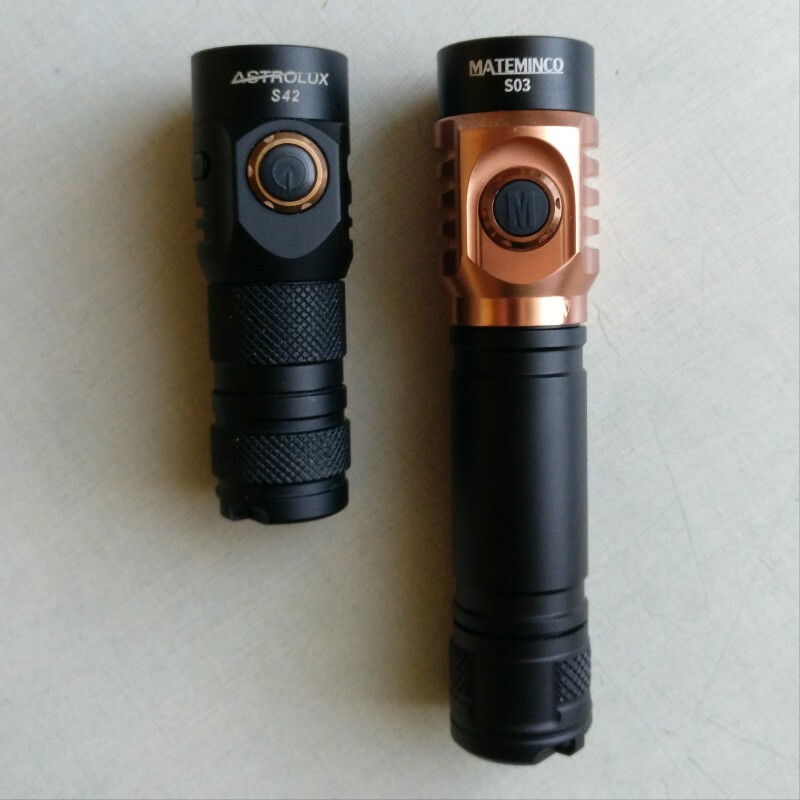 Just received this unexpectedly beautifully well-made ramping flashlight from NEAL , the Mateminco SO3 (Nichia 219c, Copper-head, NarsilM V1.3). This is my first ‘ramping’ light using the NarsilM V1.3 and now I understand what the hoopla is all about. It’s a very NICE and useful feature!!! Remember: The A6 is a BLF members’ project so it’s not a easy light to surpass! Thanks for the photos! I like the inclusion of finger rests /scallops. ..and that it comes with both tubes. I hope they list it soon for preorder. Would you mind a photo of the M lit up? I thought I saw a pic where just the M lit up. I must be mistaken. Thank you! 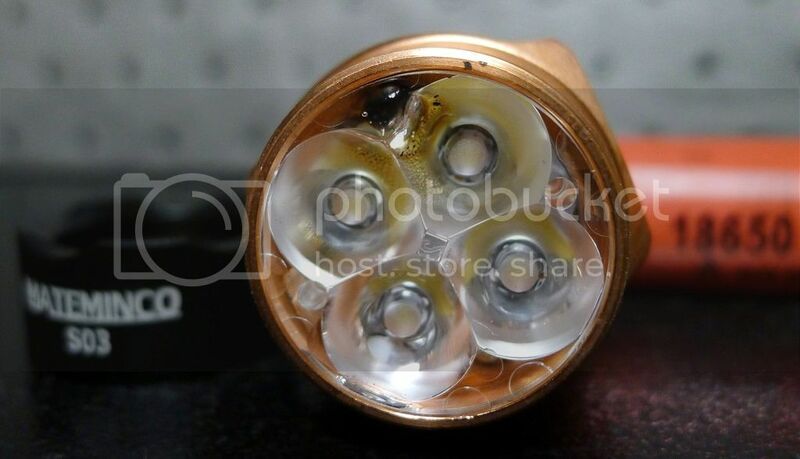 You’re welcome…actually, initially, I hesitated getting this light type of light, design-wise, at first, being a combination black ano AND copper….in all honesty I find this design at first, well, weird compared to my all usual black or gray or Ti lights. But, what the heck, I might as well try this..and I am pleasantly surprised to see it actually looks, and feels, very refreshingly nice! You’ve got to have one to in your hand to understand what I’m imparting. Thanks for the photos! I like the inclusion of finger rests /scallops. .. The finger rests/scallops is only available in this SO3 Mateminco version, while the S43S Astrolux version only the plain smooth tube for 18650 cell. Cool can’t wait. I asked freeme and he said they’re not exporting these to the West just yet but he will let us know when. this model looks better with the copper head, thanks for the shots! Sure you can order, just see post above this post ! with flatt bezel and flat big tube. 1st use with fresh Sanyo NCR18650GA, ran turbo in the darkness when I took my dog outside. After stepdown, temp was so hot could barely hold it. … shut it off and saw an orange glow in the head WTF? I watched the orange glow fade, then took bezel off to investigate. 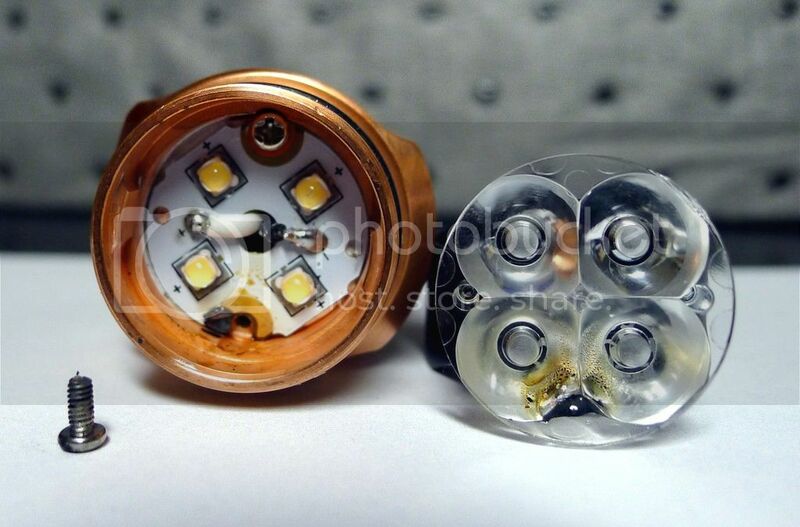 Optic was melted by a loose screw arcing near the burnt PCB hole in the head. Can any of you say how output compares to the Emisar D4S? I’m told a replacement head will be sent. You must’ve had it on for maybe 30 seconds? Whom did you buy it from? Hello , Im new here but recently bought the os3 and love it but am wondering if there’s a way to shut the green light off while the lights not on? Here is an excerpt from the manual. So what you want to do is 3 fast clicks, it will blink the battery voltage, then press/hold the button. It will do 2 fast, 1 slow blink. Then 2 fast, 2 slow blinks. Then 2 fast, 3 slow blinks. Here you have maybe 2 seconds to click the button once. The main beam should blink when you do it. Then just let it finish. I’m not sure what it will do. Maybe 4 fast blinks. Anyway, once it’s not doing anything, try turning the light on and see if the button light is now off. Personally, I prefer to have the button light on. It let’s me know battery power is connected. I will turn the tail cap a half turn to cut power. I see the button light turn off. Now it can sit on the shelf with no battery drain.